In response to requests, we have compiled a list of suggestions on how you can support PathologyOutlines.com and make it a more helpful resource for yourself and our fellow pathologists. Click here for the suggestions. A 16 year old girl had a tumor of the foot, which was excised. 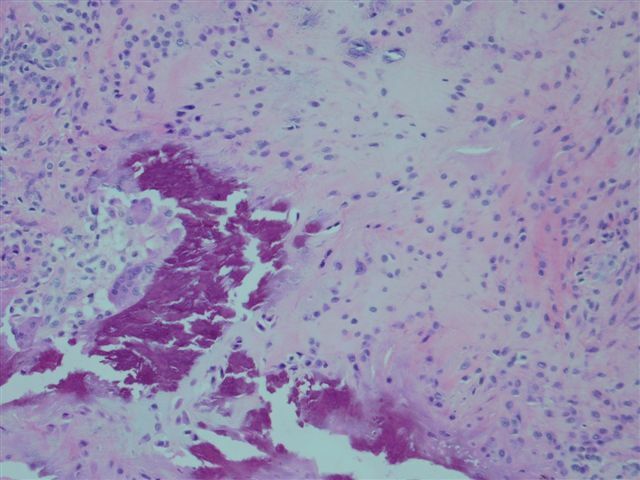 Calcifying aponeurotic fibroma is a slow growing, painless, soft tissue mass that usually occurs in the hands or feet of child or young adults, and is uncommonly found at other sites (Hum Path 1998;29:1504).� They often recur locally, particularly in children, but almost never undergo malignant transformation or metastasize.� Aneuploidy has been reported (Cancer 1994;73:1200).� These tumors are considered to be the cartilaginous equivalent of fibromatosis. 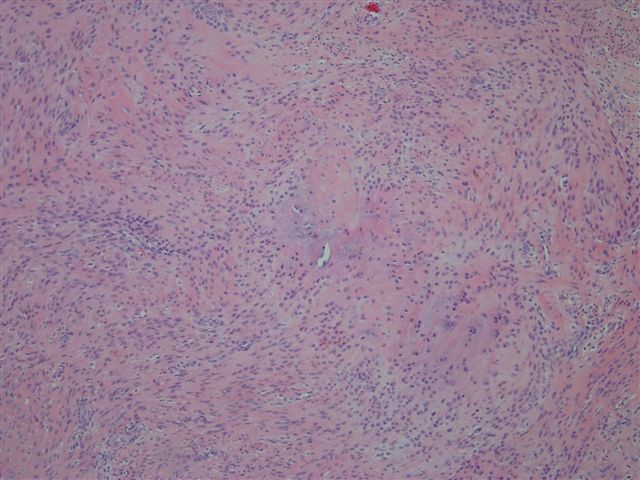 Grossly, the tumors are poorly circumscribed, gray-white, and may have flecks of calcification.� The histologic findings of the present case are typical.� The tumor shows diffuse growth of plump fibroblasts in a cartilaginous stroma with calcification.� Frequent osteoclast-like giant cells are present.� There is no atypia and no mitotic figures.� In addition, the tumor may infiltrate fat or skeletal muscle at the periphery, which accounts for its frequent recurrence.� Cytologic examination shows benign appearing spindle cells, chondroid cells, multinucleated giant cells and calcified debris (Diagn Cytopathol 2001;24:336). 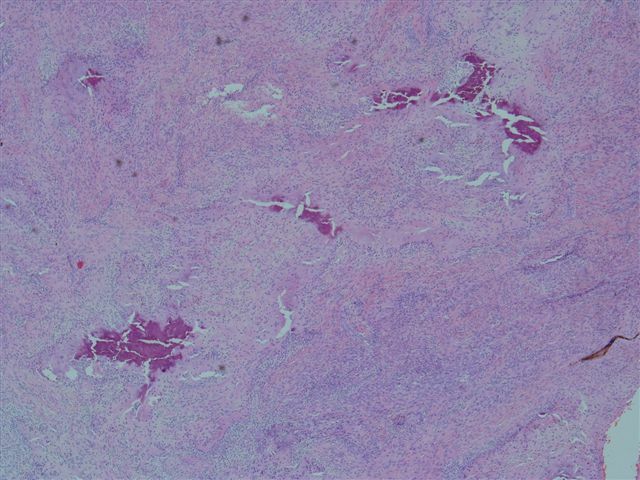 Tumor cells are immunoreactive for vimentin, CD68, CD99 and often S100, with variable immunostaining for muscle specific actin and smooth muscle actin. 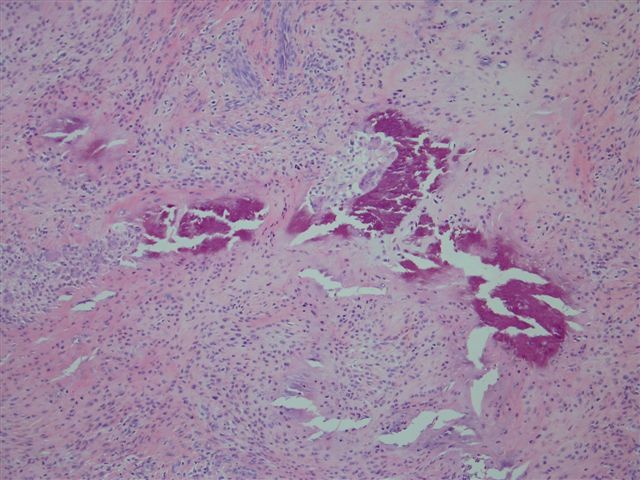 The differential diagnosis includes fibromatosis and chondroma of soft parts.� In infants, fibromatosis usually involves the head, neck and proximal extremities, the background is more myxoid than chondroid, and calcification is rare.� In older patients, fibromatosis usually lacks calcification or chondroid differentiation.� Chondroma of soft parts also affects the hands, but it is usually well circumscribed and has more well developed chondroid differentiation. Conservative excision is recommended, with reexcision as necessary.